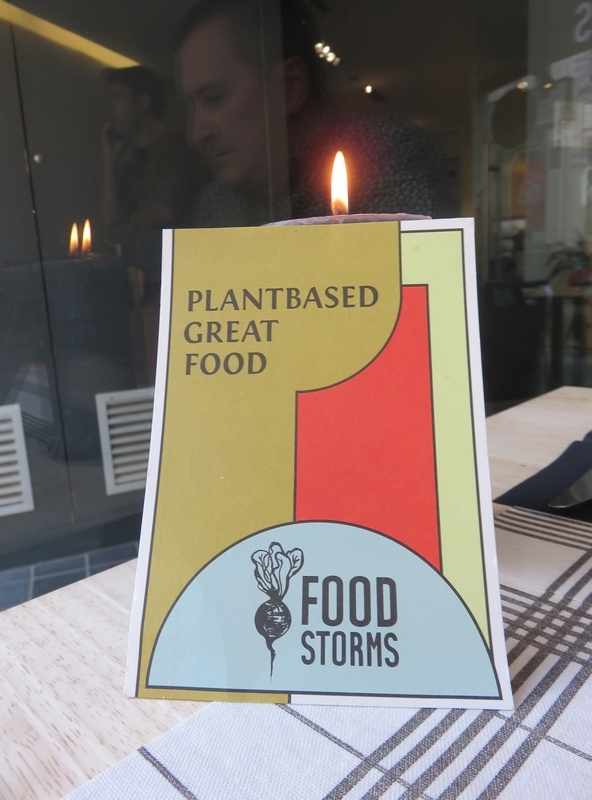 restaurant review #129 – Foodstorms is the catering business of chef Kevin Storms. 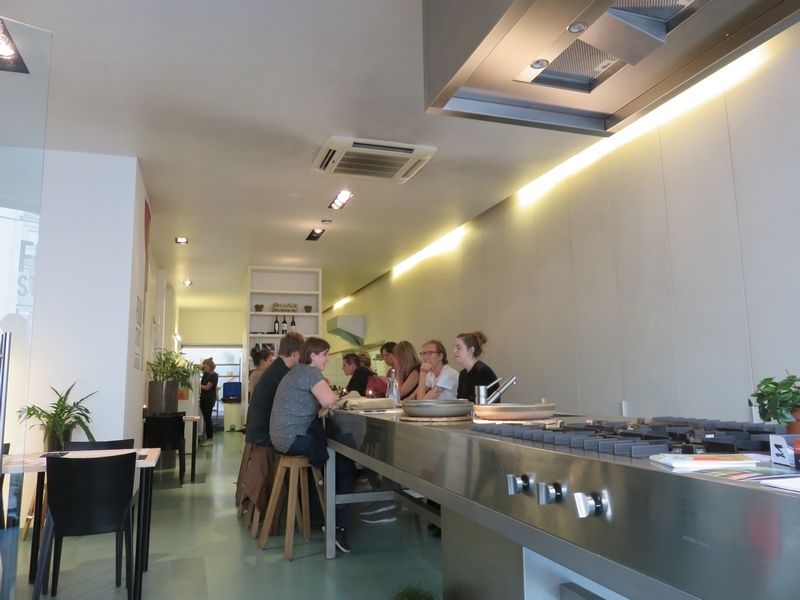 He hosts a popup restaurant on various locations throughout the year (for example also during the Gentse Feesten, festivities all over the city of Ghent in the Summer). 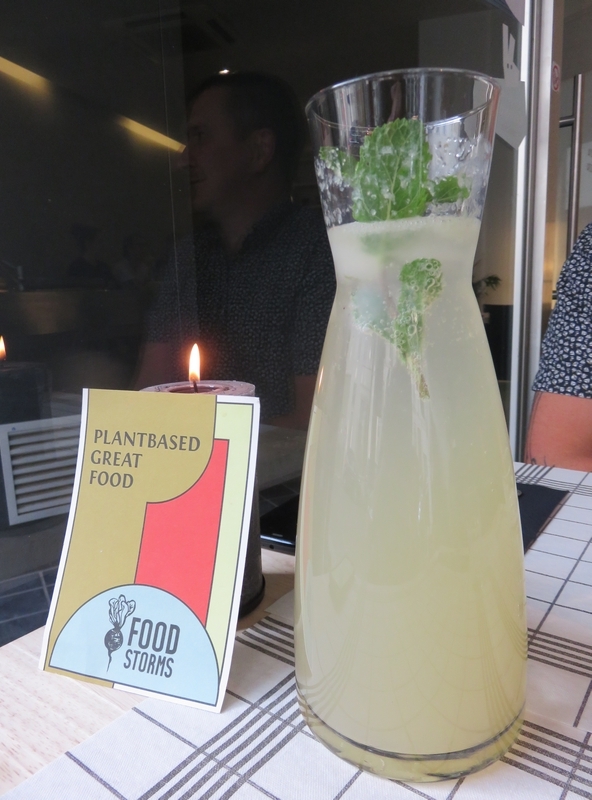 In the Spring of 2017, Foodstorms held a popup restaurant in the city center of Ghent for a couple of weeks, where they also organised gastronomical dinners on selected dates. 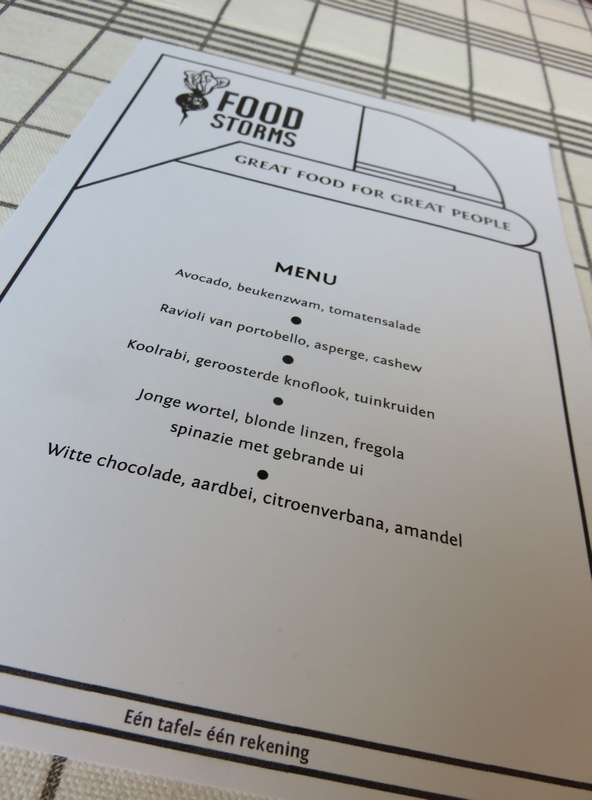 We went to one of the last gastronomical events on that location, in the St Jacobsnieuwstraat. The popup restaurant was in a place where there used to be cooking workshops. It was now set up with a large communal table in the middle, with barstools, and also a handful of tables for 2 or 4 people on the side. 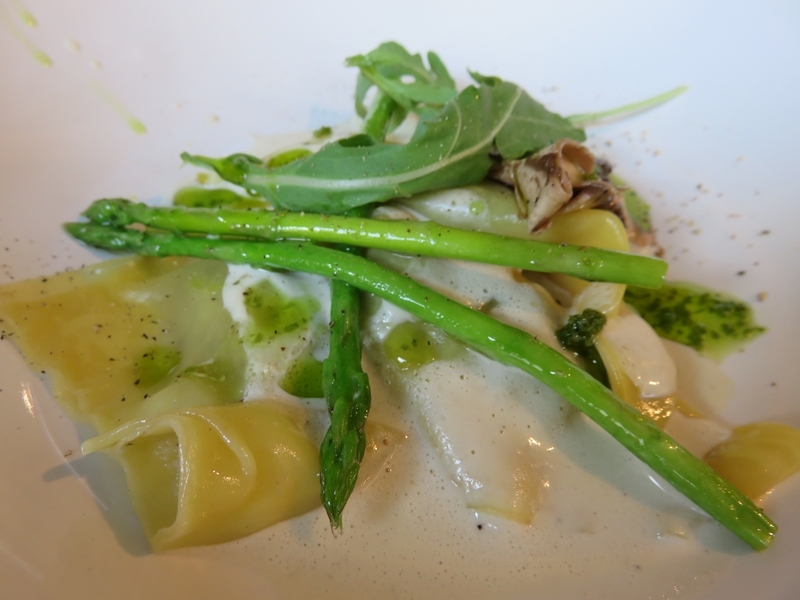 The gastronomic dinner was 50€ for a 5 course menu, prepaid when making the online reservation. 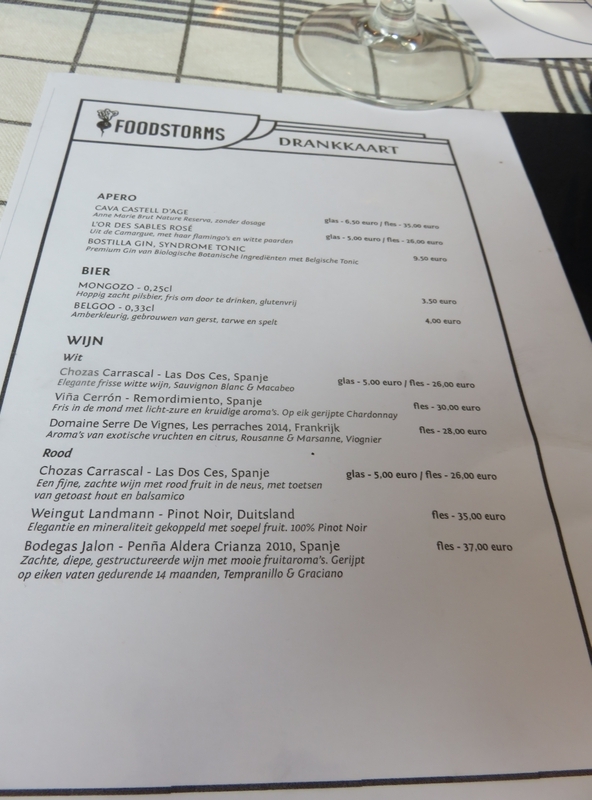 The alcohol drinks menu listed some aperos, beers and wines. We inquired whether the white wine was vegan, and were told that it was organic (hence probably vegan, but not really sure). 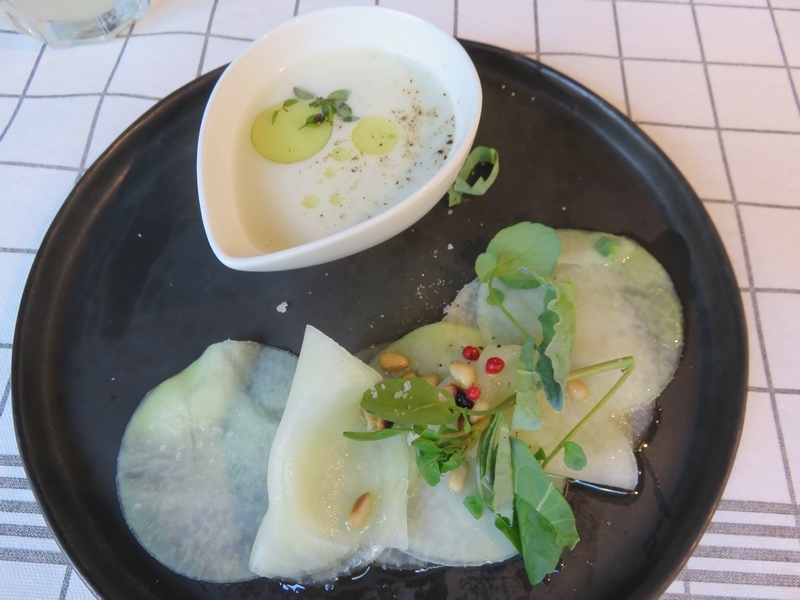 The food was great and we loved the combinations and the variety (the white cold soup served with the kohlrabi – can’t remember what it was – was not to my tasting, but that is simply personal preference). 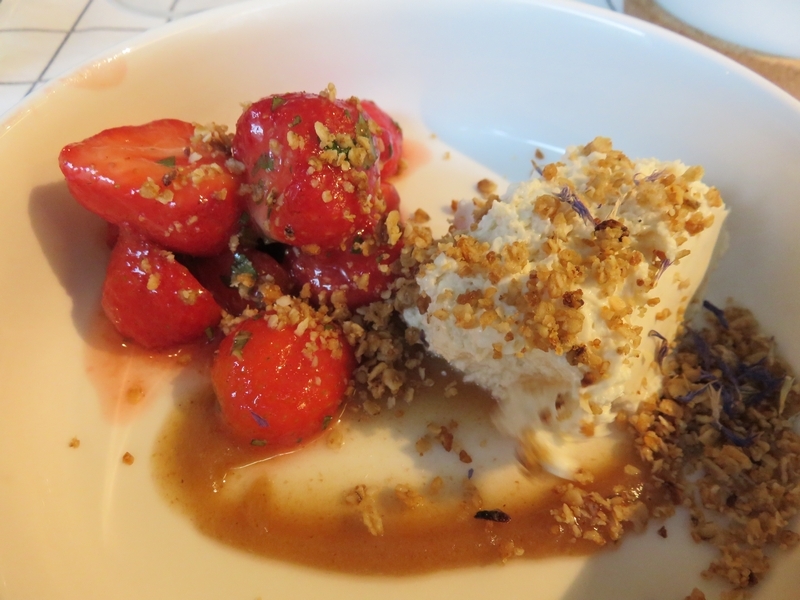 Dessert was a bit simple, but it tasted good. The tea was a bit of a bummer. We waited quite a while for it to be served, and did not have much flavour. Some cookies or chocolates on the side would have been nice too! 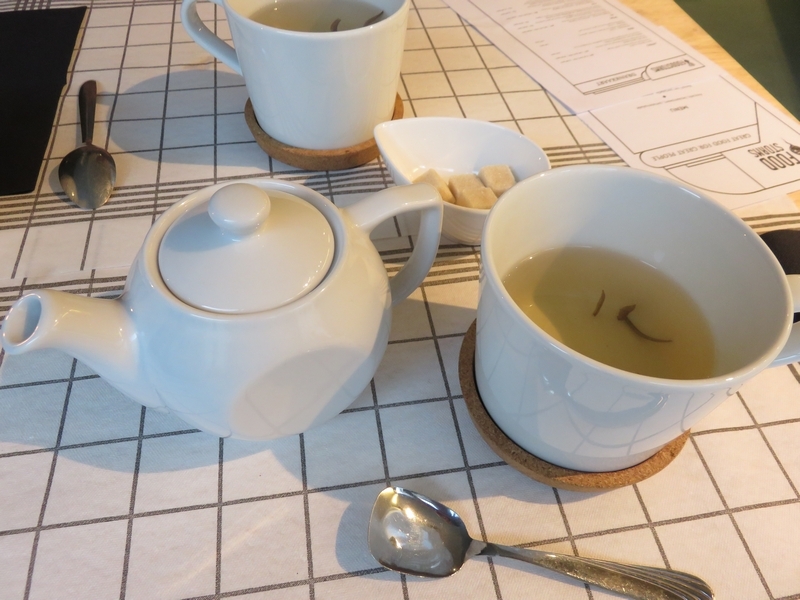 Service was friendly and courses, except for tea, followed swiftly. Accoustics were very bad though, and since it was a full house and busy, it was quite noisy and loud. The location surely has potential to be renovated into a daily working restaurant, although some rearrangements would be needed to make it more practical (eg to get to the toilet from the restaurant room was quite a way of different corridors) and create more of a restaurant atmosphere. 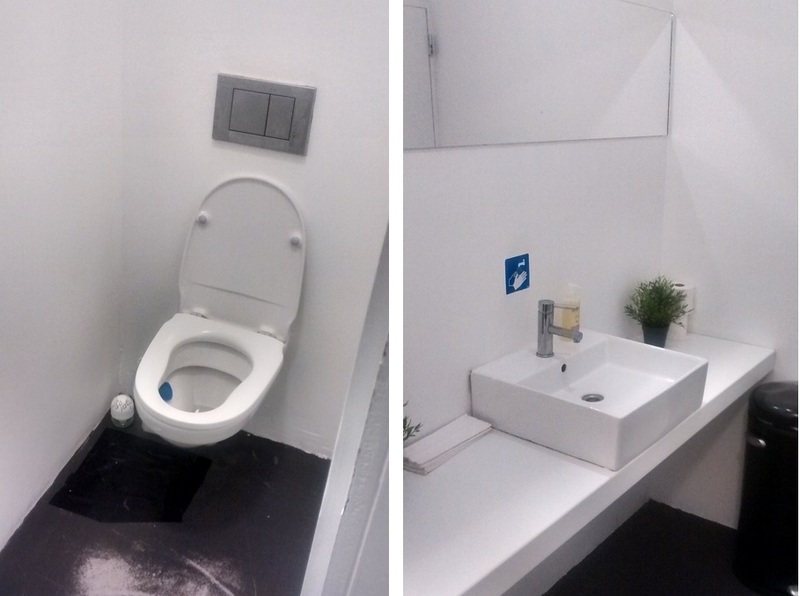 Overall, taking into account the setting, we felt it was a bit on the expensive side. 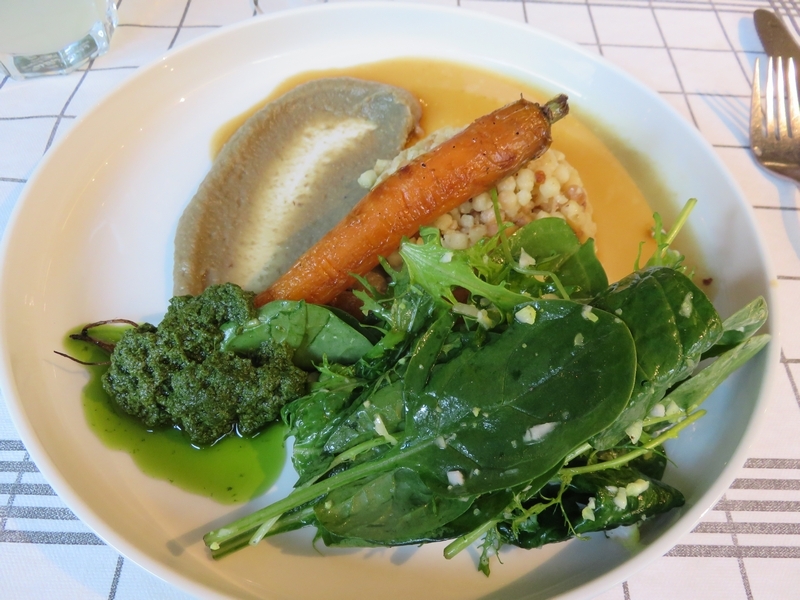 Some gastronomic restaurants will charge similar prices, but then one also can enjoy a more ‘restaurant’ atmosphere (service, comfort, table setting), which was somewhat lacking here. 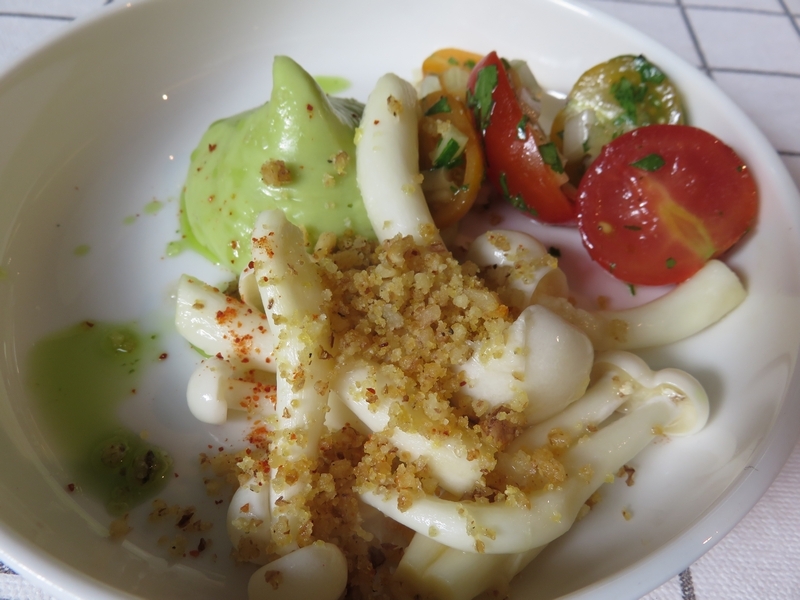 But we were happy to have tasted Foodstorm’s lovely culinairy creations, and look forward to his new popups! 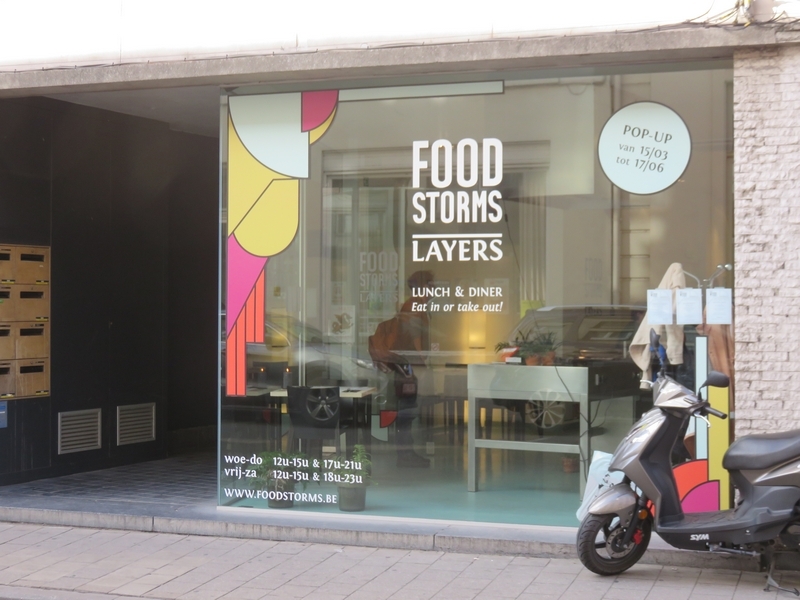 Die Pop-up, dat was toch waar Balls&Glory vroeger was, niet?